Vol 1 | Issue 1 | July – Sep 2015 | page: 41-44 | Dumbre Patil Sampat, Patil Shailesh, Dumbre Patil Vaishali , Wavre Shankar, Karkamkar Sachin, Gandhalikar Manish. Author: Dumbre Patil Sampat, Patil Shailesh, Dumbre Patil Vaishali , Wavre Shankar, Karkamkar Sachin, Gandhalikar Manish. Director and Head, Orthopaedic Department, Noble Hospital, Hadapsar, Pune- 411013, Maharashtra, India. Fingertip injuries are extremely common injuries and generally result from blunt or crushing trauma that causes compression of the nail plate to the underlying bony surface. This may result in nail plate disruption, nail bed laceration, volar pulp loss or even amputations. Modified dorsal tension band suture technique is a well established, simple and useful procedure for the management of dorsal element disruptions. Partial or complete nail plate avulsion, nail bed lacerations with or without fracture of the distal phalanx can be treated by this technique. We treated 260 patients with 288 fingertip injuries by modified dorsal tension band suture technique that resulted in the reformation of normal nail plate. All patients showed excellent aesthetic and functional outcome and returned to their pre-injury occupational activity. The purpose of presenting this article is to evaluate and document the clinical outcome associated with this simple surgical technique which does not require specific hand surgery training. Keywords: Finger tip injury; nail bed laceration; partial nail plate avulsion; complete nail plate avulsion; figure of 8 loop. Most fingertip injuries are caused by blunt or crushing trauma involving mainly children and young adults. About 50% of cases are associated with phalangeal fractures1,2. If not treated properly, complications such as scarring, obliteration of nail fold, destruction of nail plate with abnormal nail plate growth, and infections may occur3,4. Therefore, proper management of fingernail disruptive injuries is essential to avoid cosmetic and functional impairment. The recommended management strategy for disrupted finger nail injuries is evacuation of the subungual hematoma and removal of nail plate. This is followed by meticulous repair of the nail bed. Reduction and stabilisation of any fracture of the distal phalanx and approximation of the finger pulp is performed. The nail plate is then repositioned under the proximal nail fold and sutured to the hyponychium and the proximal nail fold 5-8. Numerous techniques have been described in the literature to suture the nail plate. However, attempt to repair nail bed increases trauma to this already disrupted tissue. In the tension band suture technique, which is originally described by Bindra6 in 1996, removal of nail plate and formal repair of the nail bed are avoided. The nail bed, distal phalanx and finger pulp are approximated as one unit. This technique was modified by H Patankar 9 by the use of Kirschner wire (K-wire) or an additional midline dorsal suture along with the tension band suture. He presented a case series of 66 patients with 70 finger nail disruptive injuries. He has reported uncomplicated re-formation of the nail plate in all of the cases. We have treated 260 patients with 288 fingertip injuries between January 2005 to August 2013. Patients included 168 males and 92 females of mean age 27.8 years (range, 2 to 55). Injuries with disrupted dorsal elements (nail plate, nail bed) with or without fracture of distal phalanx were selected for tension band suturing (Fig. 1). They were associated with varying degrees of injury to the volar pulp. Volar pulp injuries with intact dorsal elements, amputations, volar pulp loss and subungual hematoma were not managed by this technique. Different injury elements selected for repair are described in Table 1. The cases were followed up for a mean of 10.4 months (range 3 to 96). Meticulous analysis and repair of finger tip injuries is important for healing, maintaining sensation and function of finger tips. In our series, we have used tension band suture (Fig. 2a), additional midline dorsal suture (Fig. 2b), K-wire (Fig 2c) and stent as described in the Table 2. Injuries with disrupted dorsal elements (nail plate, nail bed) with or without fracture of distal phalanx are selected for tension band suturing. They are associated with varying degrees of injury to the volar pulp. Volar pulp injuries with intact dorsal elements, amputations, volar pulp loss and subungual hematoma are not managed by this technique. Detailed clinical history regarding mechanism of injury is taken. No specific laboratory tests are required. Anterior and lateral radiographs of the injured finger are taken to assess for fracture of the distal phalanx. Circulation of the finger tip is clinically assessed. Modified dorsal tension band suturing is performed in the emergency department or operating room. Suturing is done under local anaesthesia in adults, while children require general anaesthesia. Tourniquet is not used in any case. Local anaesthesia is given by ring block method using 2% plain xylocaine (Neon laboratories Limited, Andheri, Mumbai, India) with sterile one inch 26 guage needle and 5 ml syringe. The hand is prepped with liquid Povidone- Iodine 10% Solution (Ramadine Solution, manufactured by Nanz Med Science Pharma Pvt Limited, Himachal Pradesh, India) and draped under sterile conditions. The hand is thoroughly washed with normal saline. When the nail plate is partially avulsed, the subungual hematoma is dislodged with a jet of normal saline from a syringe. The nail plate is repositioned below the eponychium and tension band suture is performed in the form of figure of ‘8’ as described below. When the nail plate is completely avulsed, and brought by the patient, it is cleaned with normal saline and kept in Chlorhexidine solution (Manufactured for 3M India: by PSK Pharma Pvt Limited, Karnataka, Banlglore, India) for 5 minutes. This nail plate is repositioned below the eponychium and tension band suture is performed. Nonabsorbable unbraided Ethilon 3-0 in adults and Ethilon 4-0 (Ethicon, manufactured in India by Johnson and Johnson Limited, Himachal Pradesh, India) in children is used on an atraumatic cutting needle. First the suture is passed 5 mm proximal to the eponychium on one corner and then it is passed transversely to the other corner of eponychium (Fig 3). Care should be taken to pass the suture proximal and superficial to the nail fold to avoid injury to the germinal matrix. Then the suture is passed distally on the opposite corner of the volar pulp and then from there to the other corner of the volar pulp. Lastly, the suture is taken to the starting point to complete the figure of ‘8’ loop (Fig 3) dorsally. The loop is kept loose and the nail plate or the stent is reduced below eponychium. With the help of an assistant, reduction is maintained and the figure of 8 loop is tightened. After tightening, if the reduction of nail plate is not satisfactory, then an additional dorsal suture is passed below the proximal and dorsal loops in the midline (Fig. 4a to c).This additional suture is passed through the proximal and distal suture loops and not through the skin. In cases of complete avulsion and loss of nail plate, sterile foil of the suture material is cut into the shape of a nail plate and used as a stent. This stent is repositioned below the eponychium over which the tension band suture is performed (Fig. 5a to c). In cases associated with comminuted phalangeal fractures or soft tissue injuries on the volar aspect, adequate stability is not achieved on tightening the figure of 8 loop. In these situations, the figure of 8 loop is loosened, a retrograde K-wire is inserted in the distal phalanx with an electric drill and the figure of 8 loop is retightened (Fig. 1c). In children 1.2 mm and in adults 1.5 mm K-wire is used. Sterile dressing is applied keeping the volar tip open to assess the figure tip circulation. No splinting is given in adults while buddy strapping is done in children. Patients are advised elevation of the hand. Broad spectrum oral antibiotics are given for 3 days. Dressing is changed twice in the first week and then once weekly. The tension band suture is removed after 3 weeks in the outpatient department. If a stent or K-wire is used, it is removed after 4 weeks along with the suture. Patients are advised to continue follow up in the outpatient clinic to note soft tissue healing and nail plate growth abnormalities. We have repaired 288 disrupted finger tip injuries using modified dorsal tension band suture technique. Soft tissue healing was noted in 3 to 4 weeks (Fig 6 and 7). We did not monitor the bony healing. Near normal movements of distal interphalangeal joint were achieved (Fig. 7d). Nail bed infection occurred only in one case and responded well to incision, drainage and use of antibiotics. Deviation and shortening of the distal phalanx occurred in one case which was due to badly communited fracture of the distal phalanx. One patient complained of pain at the suture site which was due to tight suturing. Pain was relieved on loosening the suture. Abnormal nail plate growth was reported in a 4 year child (Fig 8). The abnormal growth of the nail plate was attributed to the injured germinal matrix at the time of trauma & not to suturing as the suture was well passed proximal and superficial to the nail fold to avoid injury to the germinal matrix. Rest all patients healed well with near normal nail plate formation. They returned to their preinjury occupational activity without disability. General orthopaedic surgeons get opportunity to treat finger tip injuries very often. Meticulous analysis and repair of finger tip injuries is important for healing, maintaining sensations and function of finger tips. There is a spectrum of finger tip injuries which include nail plate avulsion, nail bed injury, phalangeal fracture, soft tissue loss or amputation. Out of all these various types of injuries, disruptive injuries to dorsal elements (nail plate and nail bed with or without fracture distal phalanx) can be treated successfully with dorsal tension band suture technique 6, 9. In this technique, repositioned nail plate or the stent acts as a splint to the nail bed. The nail plate also acts as a natural dressing for healing of the nail bed. Reduction of the nail plate or stent below the eponychium prevents formation of adhesions between nail folds and the germinal matrix 5, 10-12. Hence partially avulsed nail plate should not be removed from its residual attachment 9 .Completely avulsed nail plate should not be discarded. It should be cleaned and repositioned anatomically in the nail fold. Sometimes the nail plate is completely avulsed, lost and is not available for reconstruction. In these situations, foil of sterile suture material can be used as a stent. This serves the same purpose as that of the nail plate. The dorsal tension band suture technique helps to hold and secure the reduced nail plate in the anatomical position. Injuries to the dorsal elements of the finger tip (nail plate and nail bed with or without fracture distal phalanx) can be successfully managed by dorsal tension band suture technique. This was described in the literature by Bindra and then modified by H Patankar. We have used the modified dorsal tension band suture technique over 9 years in 260 patients involving 288 finger tips. We found that this technique is very simple and reproducible which can be used by a general orthopaedic surgeon without the help of hand surgeon or plastic surgeon. This technique does not require removal of the nail plate or meticulous repair of the nail bed. The dorsal tension band suture technique helps to hold the reduced nail plate in anatomical position. As the suture passes through the intact skin, it is non traumatising to the disrupted elements. Considering the less number of complications in our series of 288 fingers over 9 years, we feel that the modified dorsal tension band suture is a safe, simple and effective technique with low morbidity at an average orthopaedic surgeon’s hand. 1. Guy RJ. The etiologies and mechanisms of nail bed injuries. Hand Clin. 1990; 6(1):9-19. 2. Zook EG, Brown RE. The perionychium. In: Green DP, ed. Operative hand surgery, 3rd edn. Vol. 1. New York: Churchill Livingstone; 1993: 1283–1287. 3. Ashbell TS, Kleinert HE, Putcha SM, et al. The deformed fingernail: a frequent result of failure to repair nail bed injuries. J Trauma. 1967; 7(2):177-190. 4. Hart RG, Kleinert HE. Fingertip and nail bed injuries. Emerg Med Clin North Am. 1993; 11(3):755-765. 5. Al Qattan MM, Hashem F, Helmi A. Irreducible tuft fractures of the distal phalanx. J Hand Surg Br.2003; 28(1):18–20. 6. Bindra RR. Management of nail-bed fracture-lacerations using a tension-band suture. J Hand Surg Am.1996; 21(6):1111–1113. 7. Elbeshbeshy BR, Rettig ME. Nail bed repair and reconstruction. Tech Hand Up Extrem Surg.2002; 6(2):50–55. 8. Green DP, Rowland SA. Fractures and dislocations in the hand. In: Rockwood CA, Green DP, Bucholz RW, eds. Fractures in adults. 3rd Ed. Vol. 1. Philadelphia: Lippincott-Raven; 1991: 444–446. 9. H S Patankar. 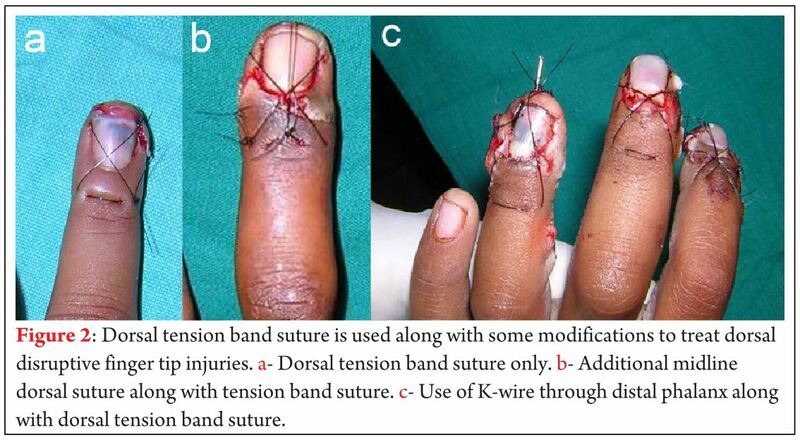 Use of modified tension band sutures for fingernail disruptions. J Hand Surg Eur .2007; 32: 668-674. 10. Brown PB. The management of phalangeal and metacarpal fractures. Surg Clin North Am. 1973; 53(6): 1393–1437. 12. Stevenson TR (1992) Fingertip and nail bed injuries. Orthopaedic Clinics of North America, 23: 149–159. How to Cite this article: Dumbre Patil S, Patil S, Dumbre Patil V, Wavre S, Karkamkar S, Gandhalikar M. Modified dorsal tension band suture technique for management of finger tip injuries : A series of 288 fingertip injuries. 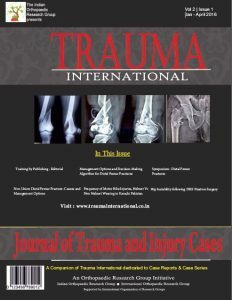 Trauma International July-Sep 2015;1(1):41-44. Tags: Finger tip injury; nail bed laceration; partial nail plate avulsion; complete nail plate avulsion; figure of 8 loop.